A teen in southern Sweden posted an online threat, saying he would carry out a German-style massacre at his school, police said Thursday. One of his men is 22-year-old Ahmed Zahir. We found him patrolling the streets of Kabul just outside the Presidential Palace walls. He describes what happened to him that day as dozens of people started pouring out of the Justice Ministry and running towards his police post in a panic. Zahir says he ran into the ministry building and was caught in a firefight, eventually killing one insurgent. While his courage seems commendable, his disillusionment over how his superiors responded to his efforts is less so, and his reactions are disturbing. “The government didn’t thank me and they did not help me afterwards,” says Zahir, with evident bitterness. By help, he means money. Police in Kabul earn less than $200 a month, considerably less than it costs to live in the capital, even for those not supporting a family. With low wages comes low morale and an invitation to corruption — Afghanistan’s police are regularly accused of being on the take. And yet their jobs couldn’t be more crucial in trying to keep together the country’s fragile security. Take Kabul, a city clogged with somewhere between four and five million people — no one knows for sure — and traffic to match that human crush. 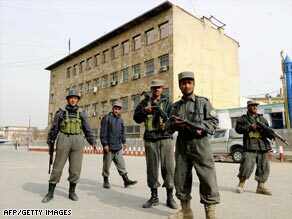 It’s not hard to see how eight Taliban fighters seemed to so easily slip into the city last month. “They used government cars with tinted glass and we have no authority to stop them” says Abdulla Mahbob, a police officer at one of Kabul’s key checkpoints. Still, coalition forces have no choice by to keep rooting for Kabul’s cops. By the end of the year, NATO will hand over much of the responsibility for securing the capital to the city’s police force. And that will be a crucial test to see if this city and this country can stand on its own, even with the Taliban standing at the gate.